I don't know where my fascination with fighting comes from. It probably started when my parents forced me to attend my younger brother's tae kwon do meets and I watched him spar. 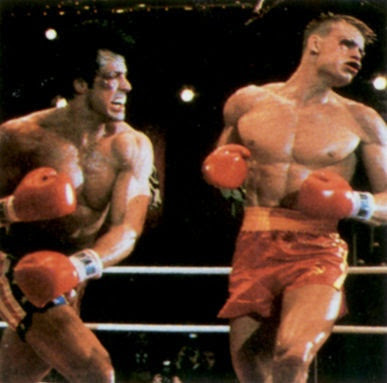 It was certainly impacted when Siberia-trained Rocky beat the steroid-pumping Soviet, Drago. Then, there was that lazy summer afternoon when I caught ABC's Wide World of Sports replay Muhammad Ali versus Joe Frazier (the one Frazier won). There was that weekend night when my college roommate and I rented an obscure video called "Ultimate Fighting Championship 1"; that's when I was hooked. Now, mixed martial arts in the form of the UFC and Pride FC have gone mainstream, showing the US the many martial arts of the world. In the US, I stuck to basketball as many of the martial arts opportunities didn't appeal to me. Boxing only used punches. Tae kwon do and karate was too much standing in a line and kicking air. I always admired my friends and relatives who did these but they couldn't inspire me to join them. In Thailand, the most popular sport is muay thai, thai boxing. Major muay thai stadiums are in the city centers of Bangkok, Chiang Mai, and Phuket. During competition, fighters wear boxing gloves, shorts, a cup, and a mouth guard; that's it. They are allowed to use nearly all parts of their body to attack: punches, kicks, elbows, knees, and they learn to use these both from a distance and in close quarters. Head butts, hair pulling, and attacks to the privates are not allowed. In my opinion, the multiple forms of attack and defense make muay thai the most practical stand-up martial artform. 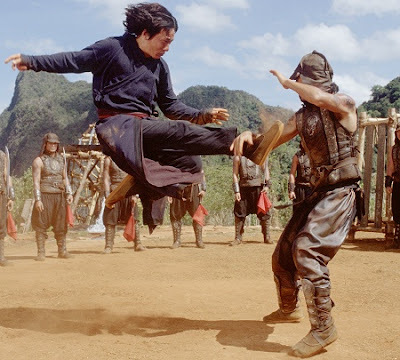 Unfortunately, you won't see Jackie Chan doing it in the movies as the flying axe kick isn't a muay thai specialty. With this in mind, I spent one week training at Lanna Muay Thai Gym in Chiang Mai. The gym is run by Canadian-born Andy Thomson. Andy spent 8 years studying tae kwon do in Scotland before going to Thailand. As a student of martial arts, he was drawn to muay thai and trained under a Thai trainer. He has lived in Thailand for 16 years and now trains beginners to professional fighters at his gym. Monday through Saturday, they gym runs two training sessions per day, one from 6:30 AM and another from 4:00 PM to 7:00 PM. Professional fighters are expected to train all sessions to have a chance to reach elite status. Sessions follow a training routine. Each session begins with a run. Morning runs are more difficult ranging from 12 kilometer distance runs to shorter 8 kilometer mountain runs. The afternoon run is a shorter 5 kilometer run. Once back at the gym, fighters begin skipping (jump roping) to warm up their calf muscles and coordination. and shadow boxing limbers up the body for muay thai. Shadow boxing is done in front of mirrors so fighters can pay attention to their technique. After shadow boxing, it is on to the heavy bag. This is where fighters practice their punches, kicks, elbows, and knees using full power; the focus is on accuracy, form, and power. The bags take a pounding! Finally, throughout the training session, fighters are called to the ring to work pads. Trainers hold pads and work the fighters attempting to simulate a fight. This is where everything is tested: accuracy, combinations, and defense. Forget to keep your hands up and the trainer will remind you with a knock to the head. Pads is really fun and challenging! Andy has at least six to eight trainers working sessions with the fighters. The primary goal for the gym is to prepare their professional fighters for stadium fights, so they get the most time working pads. The great thing for me was that beginners aren't left to fend on their own. Each session, I got trainers to correct my technique and to work pads with me. Nus was the trainer who worked primarily with beginners, helping us with technique and pads. I even got time with Andy to help work out the kinks in my punches and kicks. To say they were just "kinks" is an understatement. I struggled to coordinate my body's hip and calf movements to generate the power in punches, knees, and kicks. I often found myself "soccer" kicking, leaning into my punches/kicks, or on my heels and losing balance. Occasionally, my body generated that fluid, powerful muay thai kick denting and swinging the heavy bag, an elusive but exhillarating sensation. It takes time and dedication to get the technique down, but mastering the basics is the key to success in the muay thai stadium. As Andy put it, "The best muay thai fighters are masters of the basics." So, who attends Lanna Muay Thai gym? There are the regular trainers and professional fighters (both Thai and foreigners). There are Andy's five street fighter tough dogs who hardly allow a nap to be interrupted by simple muay thai. When I was there, there was a telecom engineer on break, a bar owner, a personal trainer looking to pick up something new, a martial arts club owner, travelers needing exercise, and many more. Men, women, young kids are all invited as long as they bring the work ethic. A crazy array of people resembling the movie Fight Club. my evil eye glanced back at a stiff heavy bag, and I wondered if my body could release that fluid muay thai kick one more time to put life into that heavy bag. To cap off my week training, Laura and I attended the Wednesday night fights at Kawila boxing stadium. Lanna muay thai fighters usually fight there on Friday nights. The fight card had 8 fights and ringside general admission seats were just 400 baht. Fighters performed ceremonial dances and then were scheduled for 5 3-minute rounds. During the fight, a massive crowd of men gathered on one side of the ring. Each round, the men shouted and motioned numbers to each other in the most chaotic betting scene I've ever seen. Also during each round, a live band enhanced the fight playing music similar to that played in India to raise a cobra from its basket. The rhythm of the music picked up with the action. The fight of the night came when one fighter was knocked down 3 times in 30 seconds by huge right hooks. As he got up from the third knockdown, he threw a desperation elbow at his opponent, knocking him out cold for one minute. It was a hard lesson on keeping your guard up at all times! Now, a break from the travel blog to discuss those Chiang Mai checkers players from the previous post I was nieve to think that they were limited to checkers. The other day we passed them and multiple colored caps were on the board. There weren't any double caps. Wednesday night must be chess night! Coke cap=white king, Sprite cap=white queen, Orange Fanta=white bishop, Pepsi=black king, Sierra Mist=black queen, Orange Mirinda(Minute Maid)=black bishop, etc. Glad I didn't buy all that Coca-cola and end up showing up on chess night. Am just now getting back to entering your blogland. Apologize. Spent lunch & portion of afternoon today [1-8-08] with your parent at their. Your blog was the focal point - together we were following you and Laura's location in SE Asia. Yet another lesson from your blog. This time - muay thai. I think I have actually seen this on the tube. Pretty rough stuff. And with your blog [words pictures and links] now understand a bit more. Thanks. Congratulations on daring and doing.